Currently the most popular social network on the internet, Facebook, has just released a new android app specifically for its new Facebook Messages system. 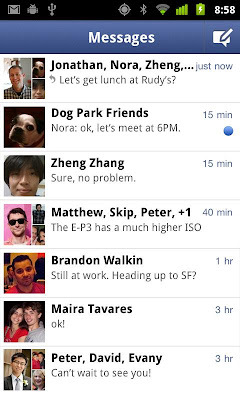 Facebook Messenger is a separate app from the official Facebook Android app, and so must be downloaded independently. I'm not sure why it wasn't added into the official app, but Facebook decided that this warranted a separate download. The idea behind it being a separate app is to make messaging and chat on Facebook simpler and faster, although I'm sure it could have just be merged with the chat option in the official app as messaging now includes chat logs. When you open the app you are requested to enter the usual Facebook credentials and log in. A list of your Facebook message conversations appears and at the top right of the page you have the option to create a new conversation. Similar to the official twitter app, you can pull down to refresh your conversations. Clicking a conversation will open the messages exchanged with that contact(s). You can upload photos as well as search for them (using bing) and attach them to a message, as well as an option to attach your location. 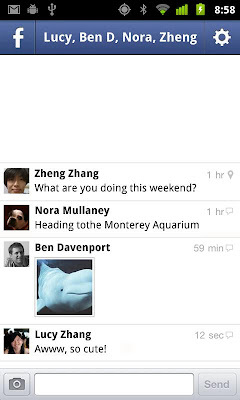 Clicking on the Facebook icon takes you back to the conversation list. The settings icon at the top right gives you the option to change notification settings for that conversation, the list of people as well as the location (if shared) of the people in the conversation. Creating a new message conversation is simple. Select a contact or contacts and start typing. This is where I came across my first issue using the app. Some contacts will have a phone next to their name when selecting them indicating that an SMS could be sent (although this is not yet supported on any of my numbers). The issue is, it does not offer any other way of messaging this contact, even though they are my friends on Facebook. What is strange is that this is not the case on all of my contacts with phones. Sometimes it offers me different options for messaging a friend. Sending messages is not the fastest process in the world either, and you cannot send another message until the previous one has been received. So, if you see a "..." next to your last message pressing send on the new message does nothing. There is also no way of knowing if a contact is online and, therefore, no way of changing a conversation into a quick chat. And even worse, there is no way to change your status to online. I am not a big Facebook user, but in my opinion, this app is expendable and why it wasn't just an update to the official Facebook app is a bit baffling. The best thing about the app is the clean UI. There are few reasons why you would ever want to use this app in my opinion. This might be Facebook trying to slow down new competition, but if they want to retain their social networking crown they need to try harder... much harder. For non-american, we have posted the apk for you to download here:Â Facebook Messenger APK.